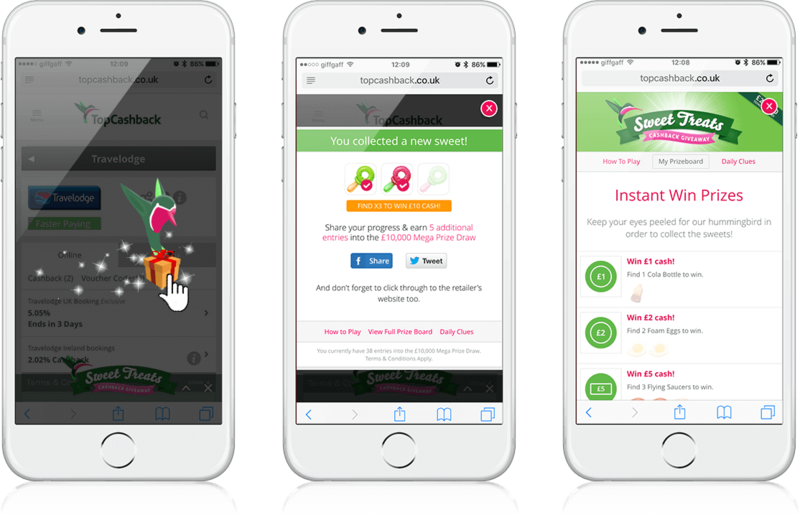 Competition Development London, Cross Platform Developers, Branded Games Development Studio Sweet Treats Competition | Competition, Cross Platform, Branded Games for TopCashback | Koko Digital Sweet Treats Cashback Giveaway - An treasure hunt style competition developed for TopCashback. TopCashback is the top site for offering money back on purchases. They were looking for a forward thinking games development agency with knowledge of social, branded games; that’s us! The client wanted a lot of boxes ticked; a social game embedded into their site to reward customers, increase retention and brand awareness. The branded game needed to be competition based and re-skinnable to keep it current and able to be used again. It was important to be cross platform and HTML mobile compatible with viral mechanics to help notch up healthy reach figures. We got to work to meet and supersede the brief, providing top UX for users. 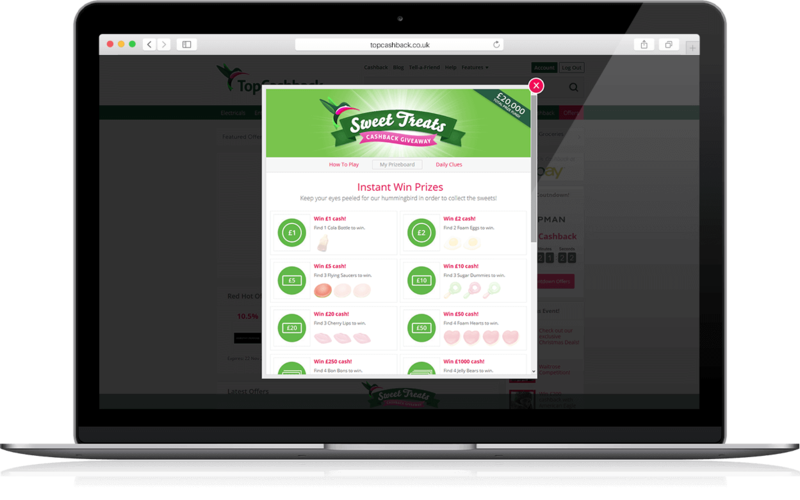 Sweet Treats Cashback Giveaway was integrated into the TopCashback site as a treasure hunt style game. 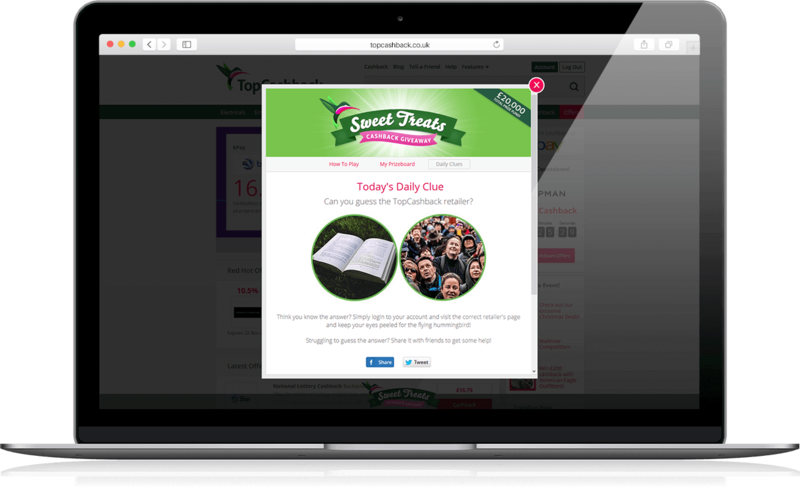 Users navigated through the site, collecting sweets from the hidden iconic TopCashback hummingbird in order to win instant cash prizes. Shareable via all social media platforms, daily clues were introduced so friends could help locate the bird. As a further incentive, sharing your progress contributed towards additional entries to the mega £10K prize draw. Analysis proved the game’s success with over 1.6m humming birds collected and 170,000+ Facebook shares. Boom!